2013 was a quiet year, travel-wise, for the boys. 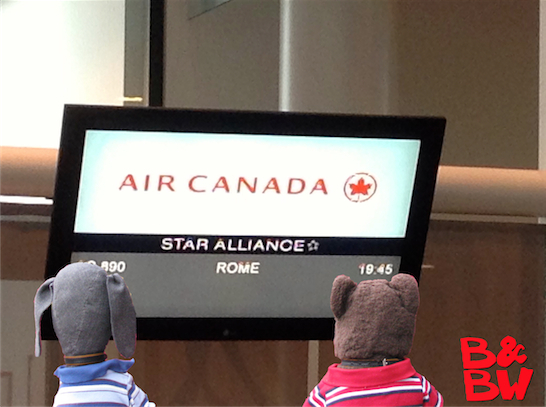 Other than two short trips to Nova Scotia and Ottawa, and a long weekend in California for Easter, their first proper vacation of the year was a five day trip to Italy in September. A quick nap in the afternoon to recover from the jetlag, the first stop was at the Trevi Fountain, where they had to jostle with the other tourists for a good photo-op. 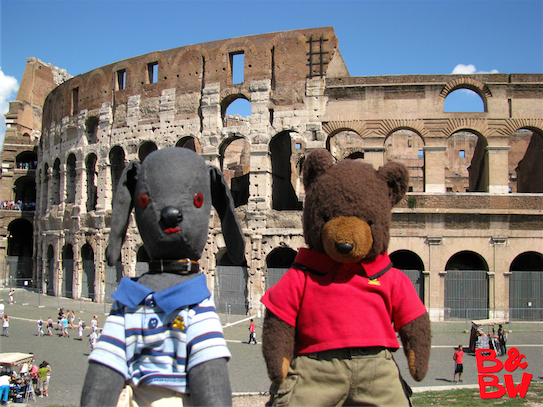 The first stop on day 2 was the Roman Colosseum. They marvelled at how such a vast structure, still the largest amphitheatre in the world, originally constructed between 70 and 80 AD could still be standing. Back home in Toronto, it would have become a condo conversion by now. Refusing to brave the crowds lining up to get into the Colosseum, the boys opted for the relatively short line-up for the Forum. 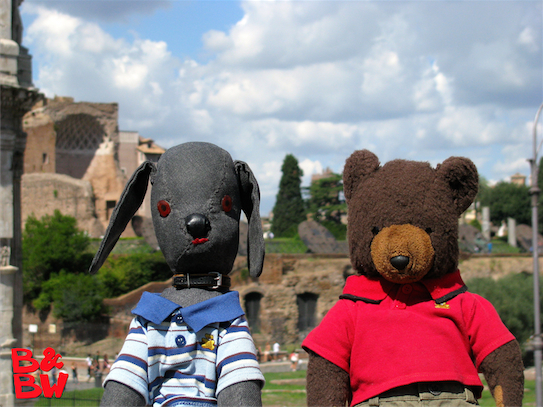 They spent several hours exploring the vast Forum complex, once the centre of public life in this ancient city. After all that traipsing around the Forum some refreshments were in order. 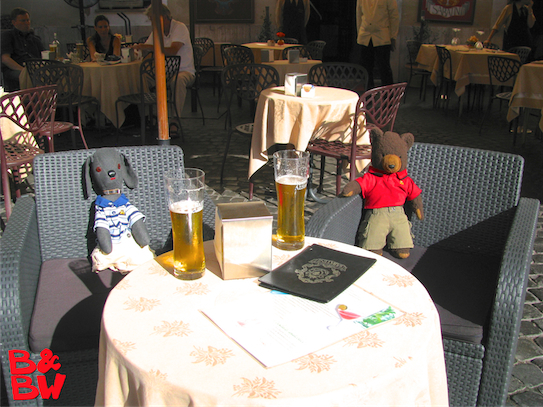 Here the boys enjoy some Italian beer at a restaurant in the Piazza di Santa Maria in Trastevere. 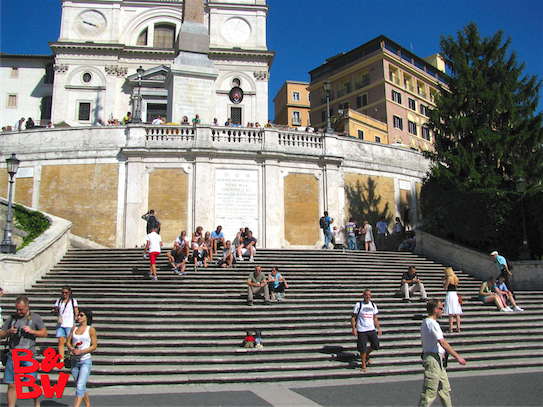 Like every other first-time vistor to Rome, the boys had to stop at the Spanish Steps for the obligatory photo-op. Move your cursor over the image for a close-up. 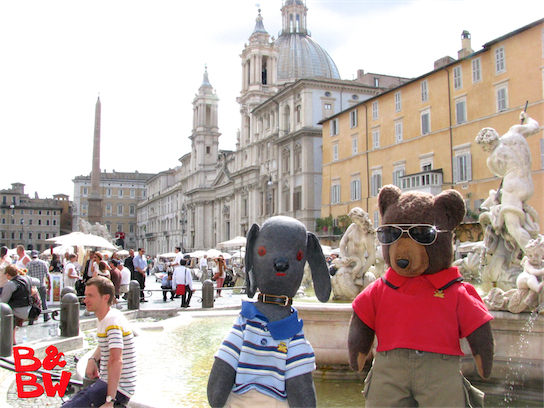 Next up was the Piazza Navona. With its beautiful Baroque Roman architecture, famous fountains and the Obelisk of Domitian, it is often considered one of the most beautiful public squares in the world. 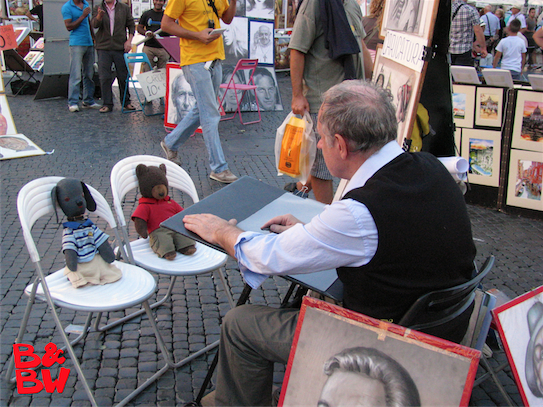 Like a lot of tourists in the Piazza Navona, the boys succumbed to the sales pressures of the local artists and sat down to have their portrait drawn. They were shocked to find out after the fact that they were being charged more, because of their non-human faces. Unfortunately, the artist was not swayed by their protests of "discrimination." 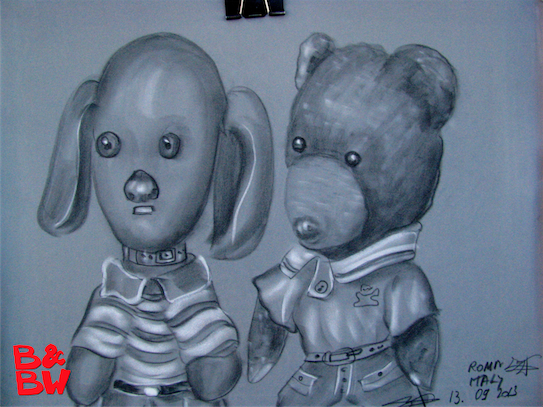 Here's Bow Wow and Bear's first official portrait. 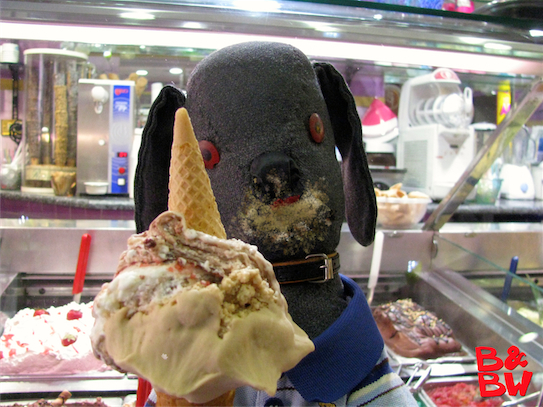 Of course, the best thing about Piazza Navona is all the incredible gelato shops nearby. 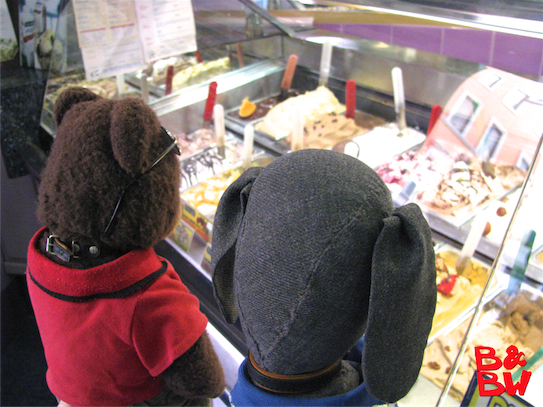 The number of choices were a bit overwhelming for a bear and dog with a sweet tooth. 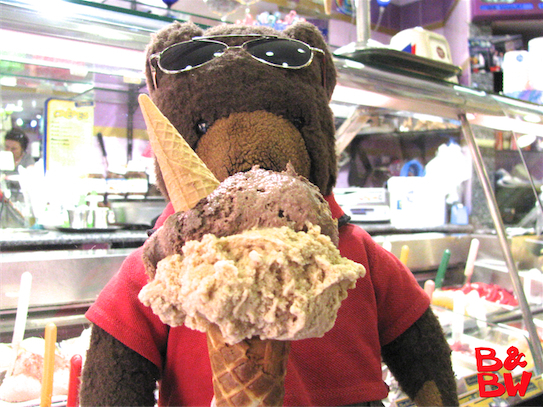 Bear finally narrowed his choices down to double chocolate fudge cookie dough and dulce de leche. Life doesn't get much better than this. 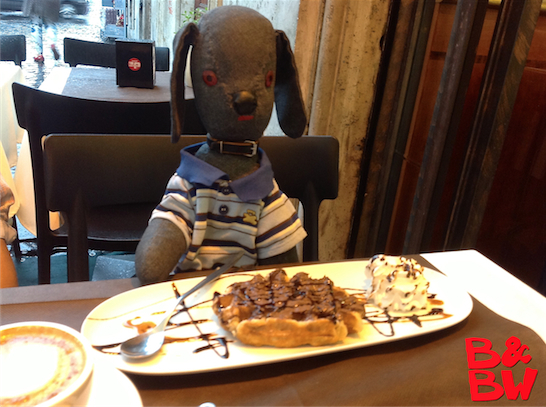 Bow Wow opted for Ferraro Rocher-Nutella swirl and hazelnut, plus a stack of paper napkins. 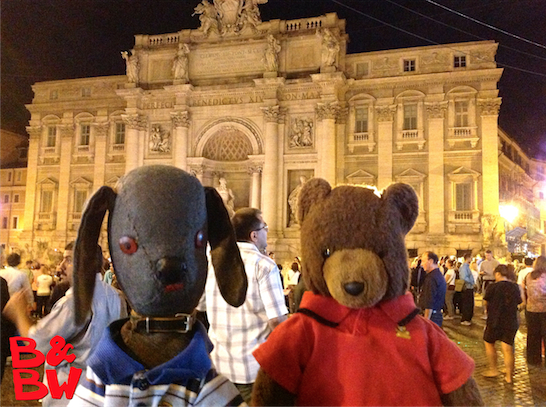 Here they are in St. Peter's Square, in what is technically the second country visited on this trip, Vatican City. Vatican City State is a landlocked sovereign city-state whose territory consists of a walled enclave within the city of Rome. With an area of approximately 44 hectares (110 acres), and a population of around 840, Vatican City is the smallest internationally recognized independent state in the world by both area and population. Coincidentally, it also has the world's lowest birthrate. 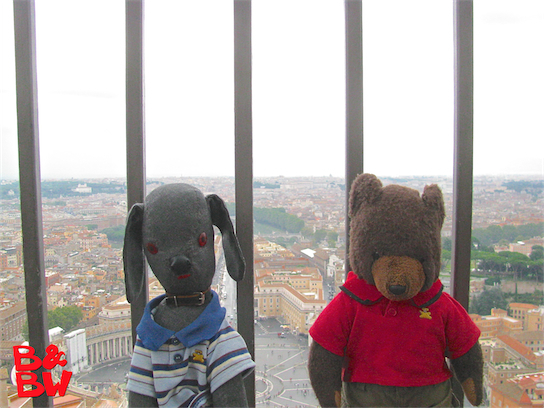 After a lot of huffing, puffing, grumbling and complaining, the boys finally climbed to the top of the dome of St. Peter's Basiica (the elevator only goes halfway). That's St. Peter's Square with Bernini's colonnade in the background. 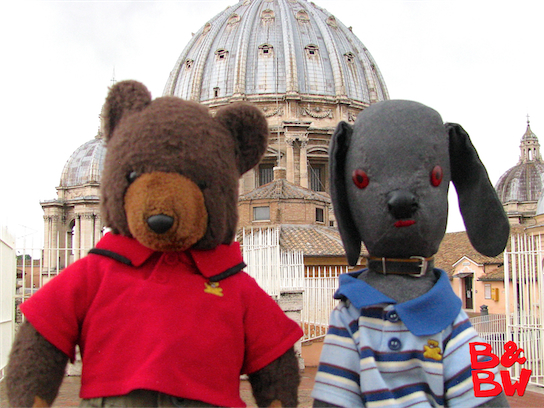 After climbing back down from the top of the dome, the boys took a break on the roof of St. Peter's. 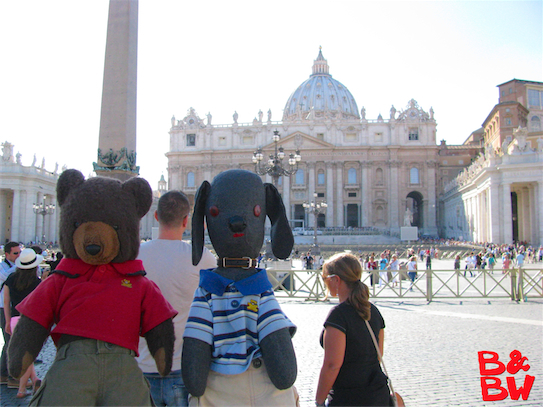 In the background is the dome of St. Peter's and the Pope's cafe on the right. Here's another shot from the roof of St. Peter's. 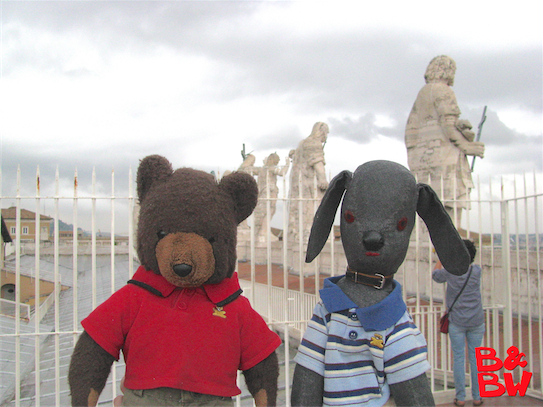 In the background are the famous statues on top of Maderno’s façade. 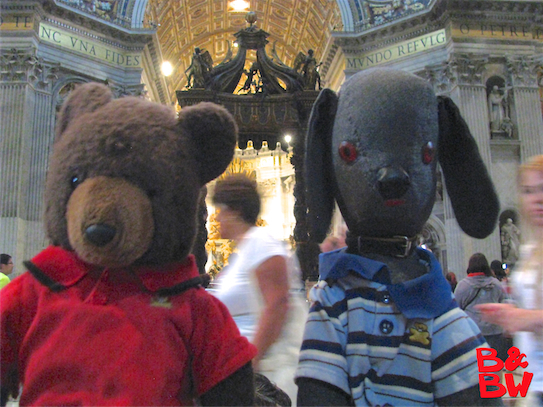 Here the boys are inside St. Peter's Basilica. The altar with Bernini's baldacchino is in the background. Designed principally by Donato Bramante, Michelangelo, Carlo Maderno and Gian Lorenzo Bernini, St. Peter's is the most renowned work of Renaissance architecture and remains one of the largest churches in the world. By Roman Catholic tradition, the basilica is the burial site of its namesake Saint Peter. Tradition and some historical evidence hold that Saint Peter's tomb is directly below the altar of the basilica. For this reason, many Popes have been interred at St. Peter's since the Early Christian period. There has been a church on this site since the time of Constantine the Great. Construction of the present basilica, replacing the Old St. Peter's Basilica of the 4th century, began on 18 April 1506 and was completed on 18 November 1626.
Who'd have thunk it that the best meal on the whole trip would be a Belgian waffle with Nutella at a cafe in Vatican City?